What is the Toronto Condo Bubble? Bluntly speaking, it's all the new aquarium-like towers along the Gardiner Expressway. Most of the units in these towers were bought by investors who enjoyed a steady price appreciation for the most part of the last decade. As prices kept growing, more and more people lined up to buy a shoebox in the sky. But since the prices have plateaued for the past two years, many investors became disinterested in investing in the condo market and the sales have collapsed. 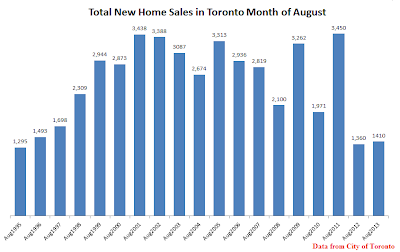 Recently the mass media reported that in August new condo sales were the lowest in a decade - but the reality is gloomier. In fact, new high rise sales in Toronto were the lowest in 13 years. 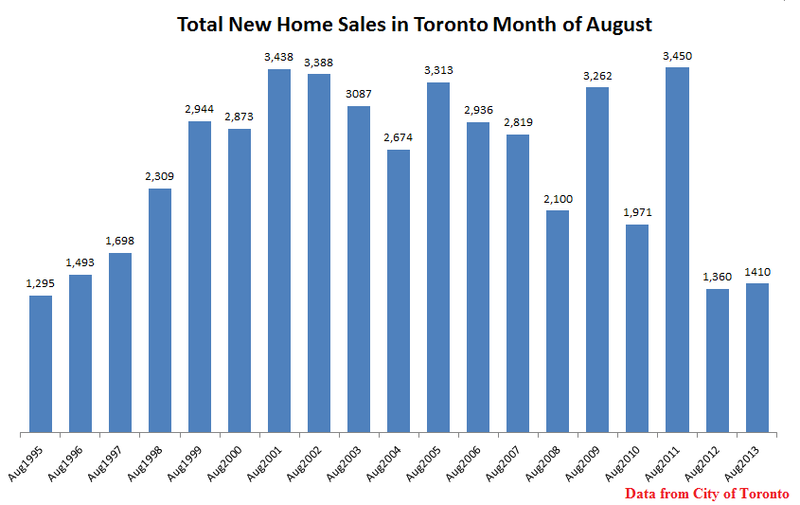 Overall, this past August was the second worst month for new home sales since 1995. Only August of 2012 had a lower sales count in the past 17 years. 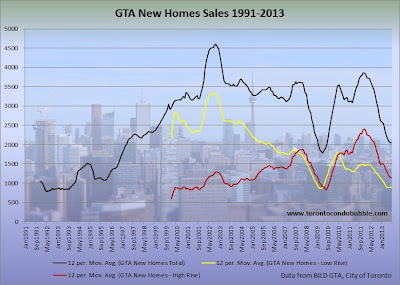 The following two charts show moving averages for new home sales in the City of Toronto and the Greater Toronto Area. 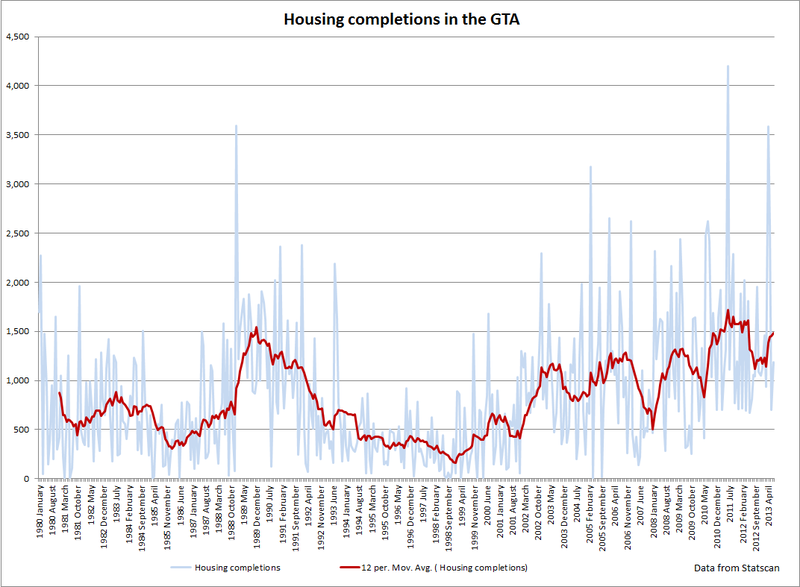 As of July 2013, there were 51,458 apartment units under construction in Toronto. 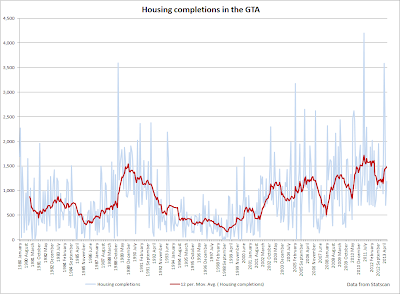 Housing completions went up by 47% this past July as compared to a year earlier. 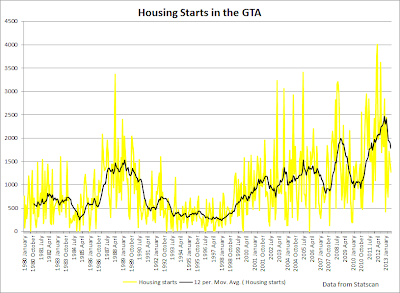 The graph below shows apartment starts in the GTA. The latest data point is for July 2013. 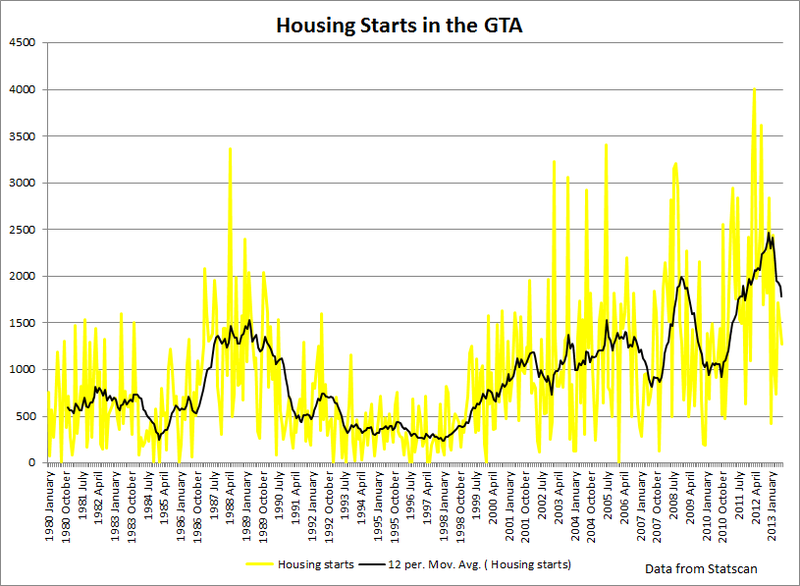 Not surprisingly apartment starts in the Greater Toronto Area continue to fall. 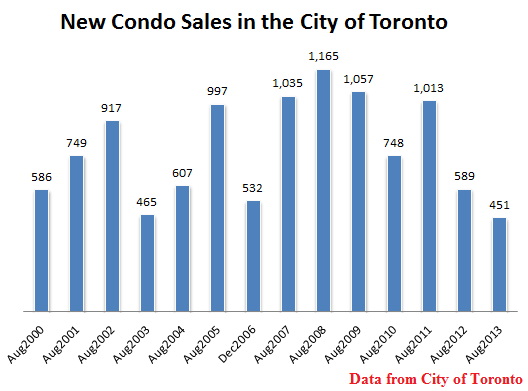 Specifically, condo starts fell crashed by 50% this past July compared to a year earlier. 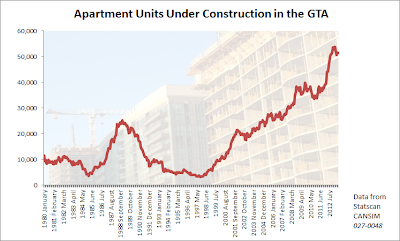 As I've said before, the condo bubble is not as much about how overpriced condos are, but more about the upcoming bust in the construction industry. All the condos built during the past decade were mostly bought by people who viewed their purchase as an investment. 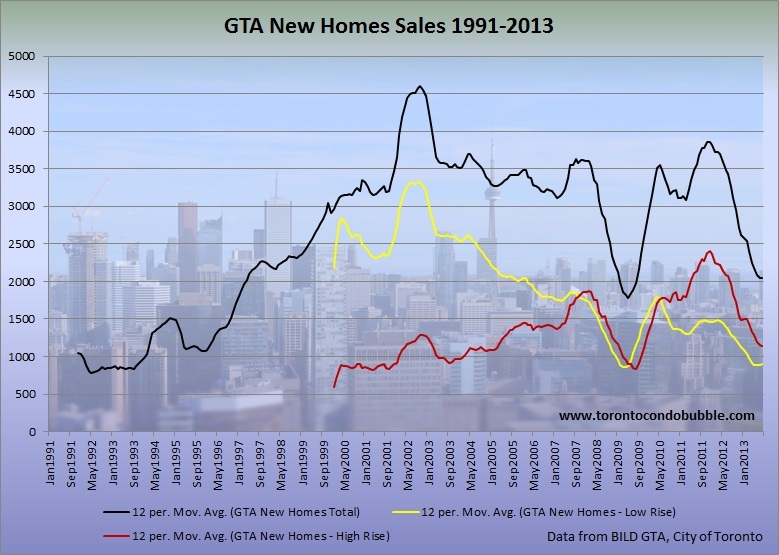 Finally, the graph above shows the reason why the new condo sales crashed in Toronto in 2012 and 2013. The reason? 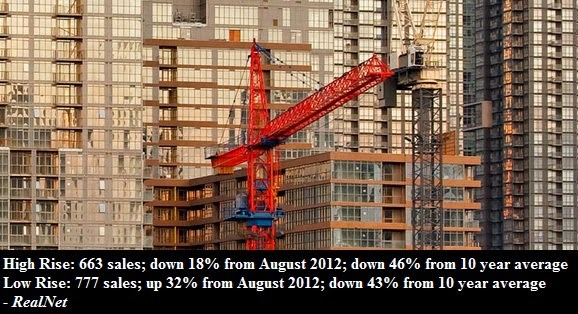 New condo prices are not going up anymore (neither are resales). 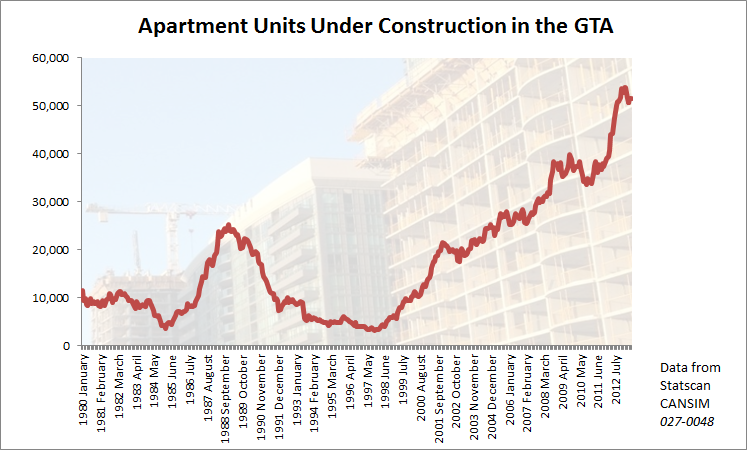 Since condo prices are no longer appreciating at 6% a year, there is no incentive to buy them. Investors have fled the market. What comes next is up to debate. Possible scenarios are a permanently high plateau, a soft landing (whatever that is), a condo crash (rapid fall in prices), or a moderate correction. Garth Turner thinks that there will be a 15% correction with a slow melt afterwards. 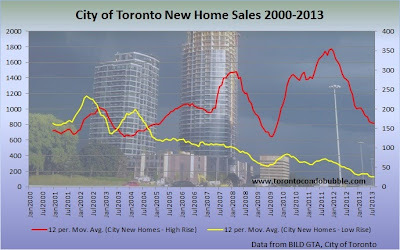 In my opinion, on average, condo prices in Toronto will fall by 20% in real terms from peak to bottom. Some buildings like the ones at City Place may experience even higher price declines. The time frame? Truth is, no one really knows.